For Alexis Harte, it was the perfect creative storm. He was a songwriter, his adolescent daughter loved music, and here was an offer to pen a song about father-and-daughter musicians for a short film being done by Oscar-winning movie director and animator Patrick Osborne. 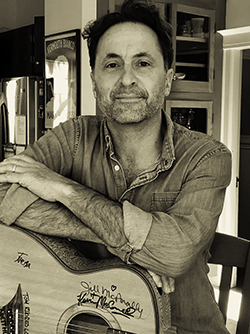 Harte, a 1991 Crown College graduate who majored in English literature and journalism, pulled out his guitar and went to work. His song, “No Wrong Way Home”—performed by Kelley Stoltz and Nicki Bluhm—became the heart of Osborne’s immersive, virtual-reality film, Pearl, which would go on to win an Annie, a Peabody, a Creative Arts Emmy, and be nominated for an Oscar in the Best Animated Shorts category—the first virtual reality film in that group. The success of the song and the film is just one of the highlights in Harte’s long career as a singer/songwriter, one that has included not only original albums but also songs that have appeared in television and film. In addition, Harte cofounded a company that has become a pioneer in scoring and sound design for Google Spotlight Stories, a series of short, virtual-reality films viewers can watch on their tablets and phones. Harte started playing music at 14 when he found an old electric guitar in the attic of his mother’s house in Berkeley. At UC Santa Cruz, Harte played in a few bands, studied journalism, and decided to become an environmental reporter. He did a two-year masters program at Yale School of Forestry and Environmental Studies, worked in the Amazon doing community forestry work, and eventually got a job as an urban forester in San Francisco. But it was music that always called to him. Quitting his comfortable government job, Harte began performing and writing songs, some of which were licensed for films, commercials, and television shows. Eventually, he joined forces with composers and producers JJ Wiesler, Scot Stafford, and Dave Lebolt to form Pollen Music Group, a sound design and scoring company headquartered in the Bay Area. The firm’s location near Silicon Valley soon brought it into the new world of technology and immersive sound design. According to Harte, his partner, Stafford, had contacts at Google, which was developing a series of animated, virtual-reality films it called Spotlight Stories as part of its Advanced Technology and Projects program. The effort was led by creative director Jan Pinkava (Ratatouille, Geri’s Game) and included talented directors like Justin Lin of The Fast and the Furious series and Glen Keane, lead animator on Disney classics like The Little Mermaid and Aladdin. Pollen Music Group was tapped to do the music and audio. The Pollen Group, says Harte, developed and used its own tools to create quality, 360-degree audio for the project. Its system not only helped solve the nausea-inducing sensation of the audio not being synced to the visuals, says Hart, but also became part of the storytelling. For Pearl—the story of a down-on-his-luck musician who lives in his car with his young daughter and whose musical talent is eventually eclipsed by hers—Harte set out to pen a song that would enhance the emotionality and power of the film. “When you’re writing (music and lyrics) for a film, you don’t want to be on-the-nose with something,” Harte says. “For instance, if you see the daughter opening a Christmas present in the back seat of the car, there is a sadness and joy to it. The question is, how do you convey that emotion in a lyric without it being too obvious and descriptive. Working with an animatic, which is a preliminary version of the movie, Harte created a song that centers on dreams and the meaning of home and, in the film, was sung first by the father and then by the daughter. Inspired by the moment Harte inadvertently stepped into the path of a speeding truck and was almost hit, the song is a study of the things we leave undone in our lives. Harte turns thoughtful when asked about the sentiment of his song and if he sees life as good now that he’s turned 50.